It was completely by chance that Monday’s Butterscotch Madeleine post coincided with the start of National Baking Week – I had no clue. Naturally finding out spurred me to bake some more, so spying a bunch of blackened bananas in the fruit bowl I set about whipping up a banana loaf. I scattered chopped walnuts into the batter for texture, and to make it even more of a treat, threw in a handful of chocolate chunks as well. The banana bread fragranced the air as it baked and came out just as I wanted, with a gorgeous golden crust and moist dense centre. It’s a fabulously versatile cake – good washed down first thing with your morning coffee, with a mug of milky builder’s brew for elevenses, part of an afternoon tea spread, or crowned with a scoop of vanilla ice cream for afters. It keep well for days in an air-tight container and even freezes well, but I didn’t really need to tell you that – believe me, the freshly-baked loaf won’t hang about long! Grease a loaf tin with butter and line the base with parchment paper. Whisk the butter and sugar in a large mixing bowl until pale and creamy. Crack in the eggs and whisk further to combine. Roughly mash the bananas with a fork and add to the bowl along with the walnuts, chocolate pieces and crème fraiche. Stir through to incorporate. Sift the dry ingredients into the bowl and gently fold into the wet mixture until just combined – be careful not to overwork. Transfer batter to the prepared loaf tin and sprinkle with the demerara sugar, if using. Bake in the oven for 1 hour then remove and test doneness with a wooden skewer – if it comes out mostly clean you can remove from oven. If not, pop back in the oven for another 15 minutes (cover with some foil if the loaf is browning too much). Remove from oven and leave to sit for 10-15 minutes then turn out on a rack to cool completely. * you can substitute with yoghurt, semi-skimmed milk or buttermilk. ~ by gourmettraveller on October 24, 2010. Looks so tasty. I do love some banana bread. Yummy!!!! 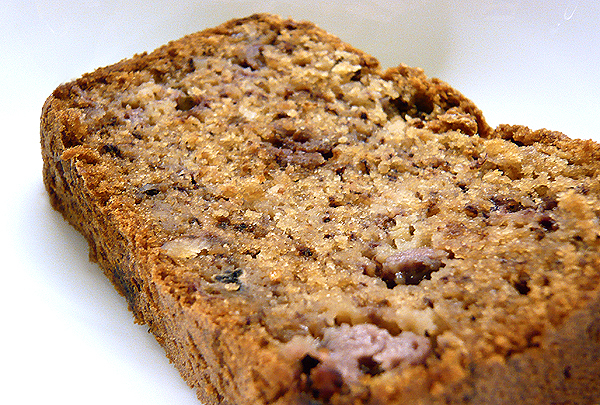 Love banana bread, it looks delicious!!!!! This looks wonderful! I imagine the creme fraiche gives it a heavenly texture :)! I love chocolate in my banana bread! This looks delicious! Ohhh, hello delicious! This looks and sounds so fabulous!!! This look great. I have attempted twice on banana bread both had mushy center, really difficult to master. in indonesia, i’ve never find bread like this. is it similar to cake? Yes, it isn’t really bread. It’s denser than sponge, but still moist.